Shows like How To Get Away With Murder thrive on viewer manipulation. It’s their nature to fake us out. So it tracks that How To Get Away With Murder would totally pull the rug out from us after last week’s penultimate episode. The end of that episode suggests that Bonnie has gotten into a major car accident. And when this season four finale picks up, it becomes clear almost immediately that Bonnie is not the character who has actually died in the car accident, and yet the opening sequence takes its time showing its hand. Eventually, it’s revealed that Denver is the real victim of the car accident. And therein lies the biggest problem with season four. Denver has never been a clearly defined character. He’s a villain, we’re told, who plays both sides, we’re told. His motivations are never shown—merely spelled out in explicit terms that make him seem more plot device than character. So, yeah, it makes sense that he’s killed. And that makes the underdevelopment of the character even worse, because the death has no real impact. It affects the plot and little else. Denver has always been a flat character, and his death barely registers on the shock meter. It’s a way to work a character death into the finale in a low-stakes way. This season has struggled to pinpoint a clear villain, and the story has been largely unfocused, the ongoing plotlines showing too many seams. Because in fact, just about every character introduced as a significant player this season has been little more than a plot device. Isaac, Tegan, Denver, and Jorge and Sandrine Castillo—they’re all cogs in the How To Get Away With Murder machine. Even with strong performances behind all of these characters, they seem hollow. Annalise goes to Tegan to try to get her to turn on Jorge, and she refuses. Amirah Vann has been incredibly fun this season, but Tegan’s place in the narrative has been rather arbitrary. The final act of the episode reveals that Tegan was willing to betray Jorge all along: As she verbally shuts down Annalise, she writes that she’s in. This is revealed in an in-episode flashback, and the twist—much like Denver’s death—barely registers! Because Tegan could do just about anything, and it would be convincing. Her motivations have been hazy since the beginning. Isaac isn’t present for the episode at all, which is both a good and a bad thing: He tends to muddle the story too much, and yet his lack of significance in the finale also reiterates just how incidental he is. It’s frustrating, just like Nate’s role is frustrating. Even for the part of the story that he’s most emotionally connected to—the class action lawsuit—he functions as mostly exposition. And then he helps usher in one of the episode’s biggest twists near the end: Bonnie has a kid. But the way that reveal unfolds is haphazard and a little confusing. Is that Bonnie’s kid at episode’s end, signing up for a new semester at Middleton? Or is that somehow Annalise’s kid? As far as How To Get Away With Murder finales go, this is one of the weakest cliffhangers. But the finale does deliver at least two compelling twists that are also open-ended questions. Michaela turns Simon into I.C.E., telling the others that it’s the only way to protect themselves. It’s a truly wicked move on her part, and when Annalise tries to accuse Michaela of becoming her, Michaela snaps back that she has merely become herself. Michaela’s perception of morality has warped over the course of this series in a way that is more complex than inconsistent. There are multiple lines in the episode that could serve as taglines for the entire series: At one point, Michaela says she isn’t evil; she just did an evil thing. Later, Connor says “we’re all evil sometimes.” Michaela’s actions embody that and the overall thesis that anyone is capable of doing bad things. And as she points out, she didn’t murder anyone. It’s easy for Asher to judge her for her bad choices, but he’s the one who ran over a woman in a fit of anger. By turning Simon into the authorities, Michaela makes it clear that she has crossed a line, but it happens in a way that feels both in-character and like a major transformation. In other words, it’s convincing character development, and this season has been flawed in that department. The other genuinely good twist of the finale is the question of whether Laurel is capable of killing her own mother or not. The wounds on Laurel’s arms certainly suggest that it’s possible, and it would honestly be a fascinating turn for the character. Laurel’s mother never became a fully developed character, but her absence raises really interesting questions about Laurel and how far she’s willing to go to protect herself and her son. If Laurel really did what we’re led to believe she did, Michaela and Laurel both make the most depraved decisions of this episode, and given their familial situations, that tracks. 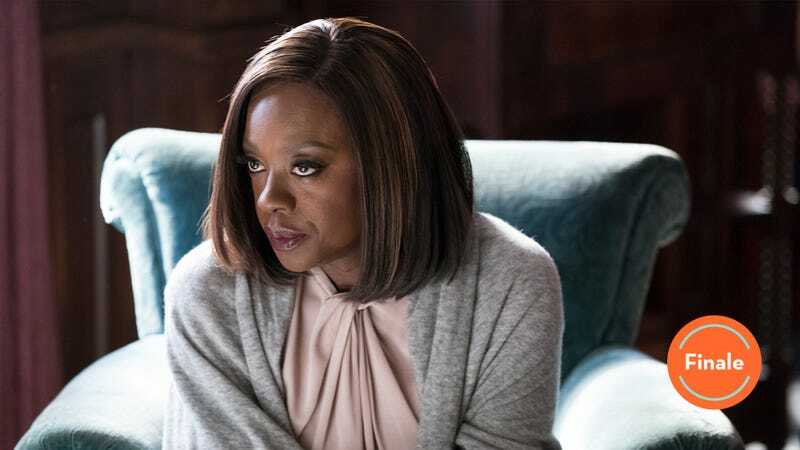 How To Get Away With Murder is, at its core, a show about trauma, and the fact that they have both inherited trauma from their families makes for compelling storytelling. But there’s too much going on in the finale—and too much of a focus on things that are harder to care about, like the death of Denver—to really let those emotional components resonate. Another season of How To Get Away With Murder has come to an end, and I have very mixed feelings! This is one of the most frustrating shows for me to write about, because I often find it very fun and very upsetting all at once! Viola Davis will always be at the top, but this season’s MVP might be Karla Souza. Liza Weil is also supremely underrated, and I am so pleased that Bonnie is not dead. In fact, it seems like Bonnie might have an even bigger role moving forward? I am shocked that Frank made it through this season alive. Ditto to Nate. And Asher? It’s probably a problem if multiple main characters seem so expendable. Since when are Oliver and Asher so close? Nate tells Bonnie that Denver didn’t keep a file on him because he’s “too boring apparently,” which is a strikingly meta moment. Nate really is too boring!